I know, I know. I know what you are all are thinking. We’re three months into 2019, isn’t it a little late post a top 10 horror films of 2018 list? Yes, that is indeed true. I actually did have planned to write and post this list online around late January/early February but due to a lot of busy things that were happening with both work and my personal life these pass three months, I didn’t get a chance to work on it up until recently. Now with that out of the way, what were my thoughts on how horror films went overall in 2018? 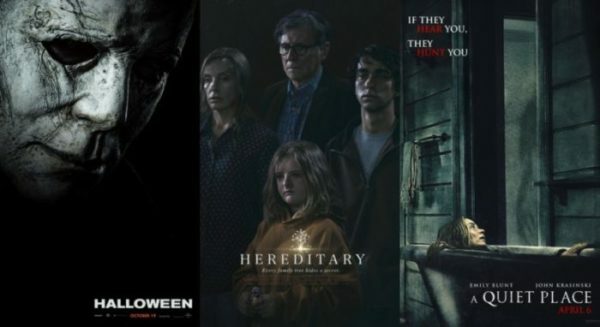 I have to admit that while I didn’t think that it was as quite as amazing of a year as 2017 was (which had so many truly fantastic horror films like the box office juggernaut IT or the Oscar-winning GET OUT), 2018 was still a pretty damn great for horror films. In fact I would even dare to say that 2018 produced quite a number of horror films that I won’t be surprised will go down as classics of the genre many decades from now. Sure like every year we do get some pretty bad horror films (believe me, I’ve seen quiet a number of them throughout 2018) but in the end, it’s the really good ones stood out the most. Since I saw quite a number great horror films during 2018, I thought I would write a top 10 list of the best ones from the year. Now before I get to my official final list, here’s another list of horror films that sadly didn’t quite make it on there, but were my honourable mentions for the year. NOTE: I’ve only included horror films that were officially released in cinemas, DVD/BluRay or streaming services in either Australia, the U.K. or the U.S. in 2018. However some horror films that I saw at film festivals during 2018 won’t be included if they haven’t had a release in either of those three countries yet. HONOURABLE MENTIONS (In Alphabetical Order): ANNA AND THE APOCALYPSE, CAM, CARGO, THE CLOVEVITCH KILLER, COLD HELL, GOOD MANNERS, GHOST STORIES, HOUSEWIFE, INCIDENT IN A GHOSTLAND, INSIDIOUS: THE LAST KEY, THE LODGERS, MARROWBONE, THE NIGHT EATS THE WORLD, OVERLORD, THE PREDATOR, THE STRANGERS: PREY AT NIGHT, SUMMER OF 84, TERRIFIER , UNFRIENDED: DARK WEB, VERONICA. Every year there’s always one horror film that comes along that I have absolutely no expectations for but after watching it, it ends up being one of my favourites of the year. 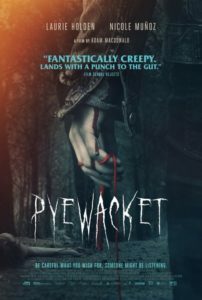 For 2018 that film was definitely Adam McDonald’s PYEWACKET. While the ending is a little bit anticlimactic, I found PYEWACKET to be a riveting and chilling horror film that features strong work from both of its two female leads Laurie Holden & Nicole Muñoz. Their character’s complex mother/daughter relationship came across as both grounded and real. If you haven’t seen this film yet, definitely make it a priority for sure. It’s one of the most underrated horror gems of 2018. 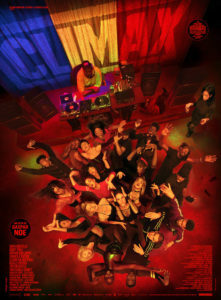 I must admit that even though I’m not really a fan of Gaspar Noe as a filmmaker by any means, I did find his latest the trippy dance themed horror film CLIMAX to be without a doubt one of his best films that he has made so far. While it’s definitely his accessible film to date wen compared to his previous work, CLIMAX is still very much a Gaspar Noe film through and through. It’s dark, disturbing, unnerving, dirty, visually stunning, unique, self-indulgent, flawed, problematic and gruelling. It won’t be for everyone but for me personally, CLIMAX is a one-of-kind insane and intense experience that definitely needs to be seen. 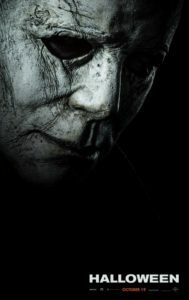 I have to admit that while I was excited that after a nine year wait we were finally getting a brand new HALLOWEEN film (co-written and directed by auteur David Gordon Green no less), I honestly didn’t like the fact this new instalment was going to ignore all the other sequels that came before (especially HALLOWEEN II) and just be a straight follow-up the original 1978 classic. However when I sat down to finally watch it, those problems I had went away pretty quickly. This was an a truly intense, riveting, brutal, creepy and extremely well made sequel that did a great job at bringing the series back to its roots while also bring its own thing as well. Plus returning star Jamie Lee Curtis gives yet another stellar turn as “Laurie Stode”. When I heard that Oscar winning director Steven Soderbergh was going to make a horror film, I was very intrigued. Even more so after hearing that he was going to shoot the entire thing on iPhones as well. While I’m sure some might be turned off by that idea alone, I was curious to see how it turned out. As expected Steven Soderbergh effectively uses the tech to create a truly unsettling and surprisingly timely psychological horror film. Sure it’s not the most original film of it’s type, but I found such a gripping film from beginning to end. Both stars Claire Foy and Joshua Leonard gave terrific performances as well. Even though I wasn’t the biggest fan of director Alex Garland’s debut film EX MACHINA, I still found it to a solid film that showed that he has the potential to a great filmmaker in the future. Luckily I didn’t have to wait too long for that, as I found his sophomore effort the sci-fi/horror film ANNIHILATION to be a stronger film in every way. This was a a truly captivating film that’s well acted, thought-provoking, visually stunning and superbly made. Plus it has without a doubt one of the creepiest monsters that I have seen in a film in ages. 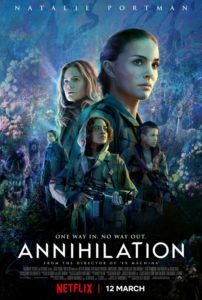 Despite flopping at the box office, I have a good feeling ANNIHILATION’s reputation will grow over time. If anyone who knows me knows, I’m a huge fan of actor Nicolas Cage. Especially when he gets to indulge into his trademark ‘Cage rage’ persona. 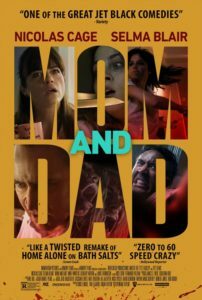 After hearing that he was starring in a high-concept dark horror/comedy called MOM AND DAD, I knew that it was definitely right up my alley based on its premise alone. You know what? I can tell right now that I wasn’t disappointed at all. No joke I had such an absolute ball with this film! A truly awesome film that takes the zombie/infected people sub-genre and spins it into something that feels fresh. It’s hugely entertaining, utterly insane and darkly hilarious! While Cage does deliver what he does best once again, the film belongs to co-star Selma Blair, who I thought was equally great too. I don’t know about anyone else, but you’ve got to admire director Luca Guadagnino. After becoming a household name with the Oscar winning film CALL ME BY YOUR NAME, he could pick and choose anything that he wanted to do as his next film. 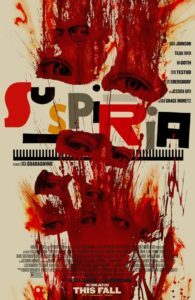 So when he announced that he was going to do a remake of Dario Argento’s 1977 classic horror masterpiece SUSPIRIA, I was very curious to see how he would pull it off. Luckily he was able to pull it off superbly. This was a spellbinding and captivating remake that while doe take certain elements of the original, it uses those to craft his own unique thing to truly terrific effect. Sure it won’t be for everyone and I can see why a lot of people would hate it but for me personally, it’s a rare great and unique remake that’s almost as good as the original was. You know what can sometimes be one of the worst things about seeing a horror film in the cinema? The audience. No matter what type of horror film it is, a loud and obnoxious audience can really sullied what should have been a scary good time. However when I went to see A QUIET PLACE, the film manged to do something that I’ve rarely seen in a public screening of a horror film in cinema before: the audience were absolutely silent the *entire* time while they were watching it. If you’ve seen the film, it’s not hard to understand why. A QUIET PLACE is superbly crafted, terrifying, emotional, riveting and brilliantly acted horror film that will definitely be a modern classic of the genre. If you still haven’t seen yet, make it a priority to watch it right now! It’s without a doubt one of the most intense horror films that I saw at the cinema in 2018. 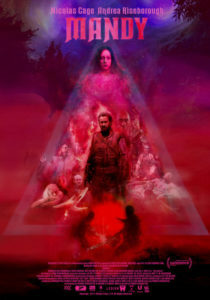 I’m not going to lie: out of the films that were being released in 2018, one of my most anticipated ones was definitely Panos Cosmatos’ MANDY. Even though I still haven’t seen his debut film BEYOND THE BLACK RAINBOW (which I need to rectify soon), everything about his follow-up screamed like it was made personally for me. Plus having Nicolas Cage involved by playing the lead role doesn’t hurt either . Did it live up to my expectations? Damn right it did! it was definitely everything that I wanted from it and more. It’s an absolutely fantastic, trippy and visually stunning action/horror film that uses its simple revenge plot to make a truly insane psychedelic assault on the senses. In fact It feels like an LSD infused medieval fantasy set in the ‘80s. Plus it gave Cage one of his best performances in years. I love this film so much! 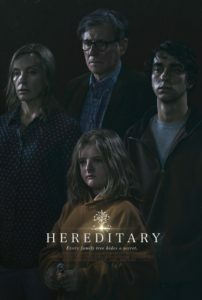 It takes a lot for a horror film leave me stunned and shaken, HEREDITARY was one that manage to do that multiple times as I was watching it. First time director Ari Aster’s debut feature is an absolutely phenomenal, intense, devastating, unnerving and terrifying horror/drama that’s definitely ranks up there as one of the best horror films that I have seen so far in this decade. In fact I would go on a limb and even say that this film is full-blown horror masterpiece that deserves to stand alongside similarly themed classics like THE EXORCIST, ROSEMARY’S BABY and DON’T LOOK NOW. Plus it has at the centre of it a truly astonishing career-defining performance from lead star Toni Collette. No other horror film (nor even non-horror films as well) from 2018 has gotten under my skin as much as this one did. There is definitely no doubt in my mind that this was my number one horror film of 2018 for sure. Well, there you have it. Those are my official top 10 horror films of 2018. Agree or disagree? Let me the comments below and as well as what were you favourite horror films from 2018 were!